1. Prepare rice as label directs. 2. Meanwhile, fill deep, 12-inch sauté pan with 1/4 inch water. Place 9-inch diameter cake rack (or roll up a 20-inch long piece of aluminum foil to form a ring) in pan. Cover pan and heat water to boiling over high heat. 3. Meanwhile, in 9-inch pie tin, whisk together garlic, soy sauce, sesame oil, juice, ginger and honey until well combined; whisk in 2 tablespoons onions. Place salmon over sauce. 4. Place pie tin on cake rack (or over foil ring); cover pan and cook over medium heat 6 to 8 minutes or until salmon turns opaque throughout and internal temperature reaches 145°, adding bell pepper and carrot over salmon during last 2 minutes of cooking. 5. Meanwhile, in small skillet, toast sesame seeds over medium-low heat 3 to 4 minutes or until toasted, stirring frequently. 6. To serve, carefully remove pie tin from skillet. 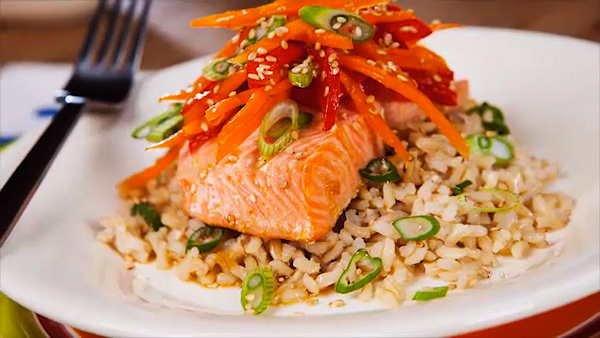 Place 2/3 cup rice on each of 2 dinner plates; top with salmon and vegetables. Pour any sauce in pie tin over salmon; sprinkle with remaining 2 tablespoons onions and toasted sesame seeds. If your pan doesn’t have a lid, cover the pan tightly with aluminum foil or use an inverted second large pan. 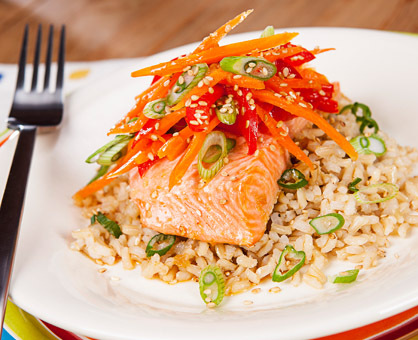 Make this dish gluten-free by using gluten-free less-sodium soy sauce.